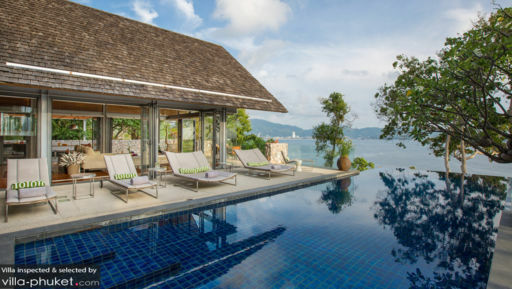 Villa Hale Malia is a two-level vacation residence that represents posh contemporary Thai design. Areas are discriminately appointed with superbly crafted furnishings and equipped with premium comforts for your total satisfaction. Laid out on a headland rising from Kamala Beach, Villa Hale Malia holds out to you a swanky holiday amidst a naturally magnificent environment. 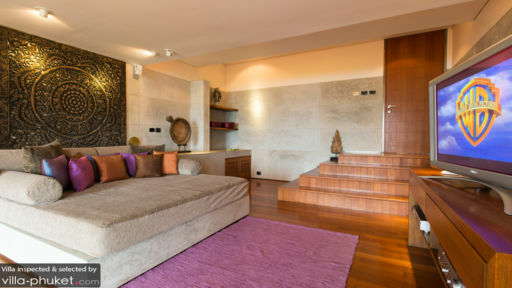 The villa’s four air-conditioned bedrooms – one master bedroom and three guest rooms – are on the ground level. All bedrooms open out to furnished terraces – although those of the master bedroom and one guest room have alfresco whirl pools or tubs. Jutting toward the distant blue horizon from the villa’s topmost level is the beckoning 14-meter infinity pool. On both sides of the swimming pool are two areas where you can simply relax after climbing out of the water – one of which is a spacious sala. Alongside the infinity pool is the transparent and cool living area. Behind this – at the angled part of the common area – is the indoor dinner table and adjacent is the fully-equipped, ultra-modern kitchen and bar. At the other side of the indoor dining area is a study with a private sauna and steam room. Alongside the living area – on the other side – is the alfresco dining and barbecue area. On the ground level of the villa is a home theater. The villa’s expedient staff will carry out an array of services that can turn your entire vacation into pure bliss. 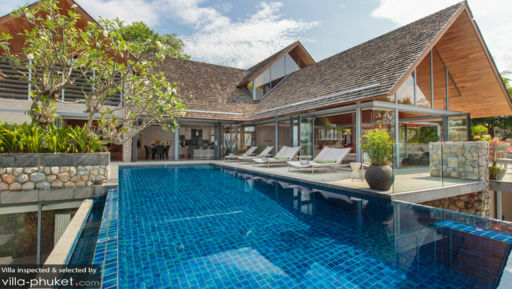 Located within the vicinity of Kamala Beach, Villa Hale Malia is just five minutes away by car to the main beach. If you don’t see a red flag, it’s a green light for you to swim, snorkel or even surf. After dark, get a taste of Thai specialties available buffet style – as well as of Thai dance and music in a flamboyant traditional revue.